Oh dear, I’m sorry, I’ve neglected you so badly and really I’ve no excuses except the usual about time and lost mojo but I’m back now and feeling much better. Anyhoo, I’m currently knitting a scarf for my uncle. It’s from some handspun yarn and unfortunately it hasn’t been a straightforward knit. The first issue was a shortage of yarn. I realised that the scarf was going to be very short around 2/3 of the way through the ball and then kept knitting some more because well, denial. Eventually I gave in and ripped it all back. It was one of my earlier yarns so it was quite dense so I decided to run it through the Hansen to relax the ply twist somewhat and hopefully eek out a liitle more length as a bonus. I re-soaked, thwacked and dried it again and did a bit of stash diving to find another handspun yarn that I could combine so as to add more length. I then tried striping the yarns but changed my mind about the pattern I was using. 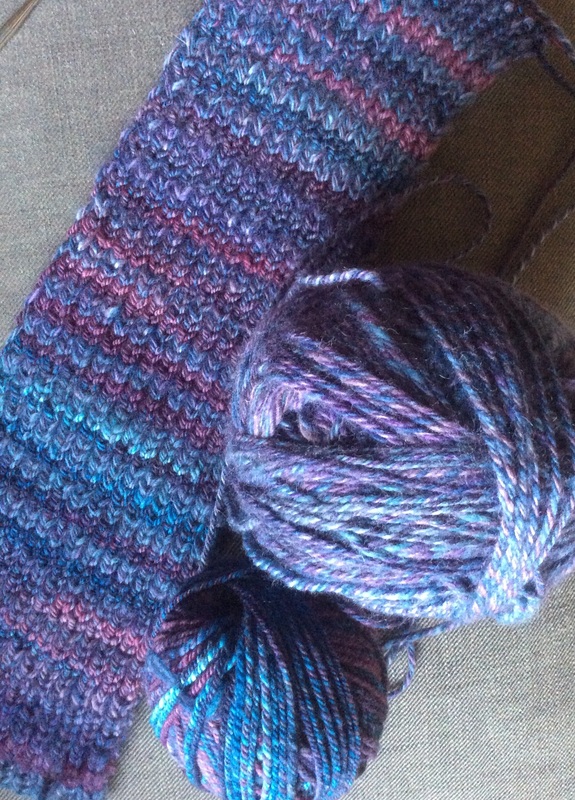 I’m now using a 1×1 rib, slipping the first stitch à la Jarrod Flood’s classic Noro scarf. Stitch count was an issue too, as it needs to be wide enough but only just as I’m worried about having enough yarn. So after much knitting and re-knitting I’ve ended up with this. I’m happier with it now, the fabric is lovely and elastic and sproingy. The colours are lovely; purple is my uncle’s favourite colour. Has this put me off knitting with handspun? Not likely! I still get more joy out of knitting yarn I spun than anything else, even if I have to knit and re-knit again and again. Hopefully, I’ll have this finished soon so I can cast on for a second sock, though there may be running out of yarn issues on that too. Anyway, I hope you’re all well.